Are viruses alive? Over the past century, members of the life science community have shifted their opinions back and forth. Many say no, some say yes. I personally think they should be considered alive because they are composed of protein based vectors encapsulating DNA/RNA. Independent reproductability shouldn't be a criteria for life because a LOT of organisms have symbiotic relationships which they depend on for survival. I also think the lack of metabolism reason is a cop out. When we break down metabolism to its basic components, its just the transfer of electrons, which also occurs in viral protein mechanisms. I say yes, because life is a nebulous concept anyway. The particles composing living and non-living entities are the same. The ability to evolve and self replicate only becomes apparent when we zoom the microscope out far enough. Yes, a virus needs to hijack other cells in order to replicate. And a protist requires sunlight in order to replicate. Nothing truly replicates entirely on its own. We should define life more by its function then its form. Definitions are more useful when they describe how something acts and what it does as opposed to what something inherently is, at least when the 'what something is' in question is so indefinite. People try and draw a distinction between life and what are effectively naturally occurring machines when really, all living things are just machines. And if certain biopoiesis theories are correct, the line becomes even more hazy. Since life originated from machine-like crystals or some other such mechanism. If true, then like the line between the 'non-living' self-replicating thing and the first living cell is going to be hazy. Just like the line between a species evolving into another species is always going to be hazy and impossible to pin point. And I see little value in trying to draw that line. If it were up to me, edge cases for living things would be called life, and just given new categories based on their properties. Interesting definition; by that definition, many computer viruses are alive as well. A self replicating computer virus that, without any further commands from humans, could spread throughout computers and was capable of change over time? I would have zero problem calling that alive. The world inside a server is no less legitimate than the world we inhabit. It's likely everything is just information, anyway. The idea of Bitcoin agents is one that, were it implemented, create synthetic life in my opinion. Billvon just went all SKYNET on us! It is a meaningless debate. Life is analog, not digital. There is a spectrum, more or less continuous from wholly inanimate to wholly alive. Where you place the dividing line is a matter of convenience and perspective - nothing more. And ultimately it is subjective. There is a case to be made that me typing this reply is just a consequence of a massive chain reaction and that it is no different and no more complicated than a planet orbiting a star or a rock rolling down a hill. From this point of view, life isn't a real state of being at all. Everything is just an impersonal cog in the machine. Even consciousness or a 'soul,' if you will, is wholly subjective without any relevant definitions outside of an individuals perceptions. I don't really hold to this view, personally. But there you go. That's interesting. I'd like to know more about that. So, what's an example of how the virus might modify itself or become modified over time? How would that work? The theory would be that a computer program is given access to an online bank account with limited funds. The program then has to pay for its own server space somewhere. It presumably has certain skills and has to find some way to make money. If it runs out of money, it dies. If it turns a profit, it is programmed to split itself in two. Like an amoeba. It splits its money as well. Since it is a learning program, both identical programs will diverge. If one changes for the worse, it is less likely to die. If one learns for the better, it is more likely to reproduce. Programs that get tricked easily, or hacked, will not live long. Anyway. Programmers will put improvements on the internet and sell them to these agents. The improvements that work? Other agents will observe this and purchase it. Its evolution. The breeding ground is the internet. What is the point? The point would be that in this environment of evolution, where the programs grow and increased intelligence is rewarded with more offspring? The programs will grow in intelligence exponentially faster than they ever could in a sterile environment. They will improve themselves faster than a programmer ever could. The risks are largely economic. These things don't spend money. They get money only to horde and make more of themselves who will horde. If enough money was trapped in their accounts, it could devastate a country. Depends how you define life. I could define fire as alive. It reproduces, grows, consumes food/fuel, has functional activity, & dies. However, most would not consider fire alive. Which is why it is all arbitrary. For me, and as an other commenter also mentioned, it all depends upon how you define life. You can stretch, narrow or tweak you definition of life so as to include or exclude viruses from the domain of life depending on your own tastes or biases. You can make viruses alive or not alive with one small sentence. JG, said it was a "meaningless debate". Perhaps he meant it's one for the philosphers? Once you've pondered viruses for a while you might want to move on to such entities as virophages, virusoids and viroids. Excuse me but I do not see “virus” included in the three branches of life. Did they appear the same time life did? By any worldview they had to appear after life was established. I also think the lack of metabolism reason is a cop out. When we break down metabolism to its basic components, its just the transfer of electrons, which also occurs in viral protein mechanisms. Viruses don't have to appear on the tree of life to be described as living or non-living. A fully synthetic life form created in the lab would not fit on the tree either, which would not lead us to categorise it as non-living. Viruses can have their own tree(s) - two super-domains of life. As Forterre describes it: capsid-encoding organisms and ribosome-encoding organisms. There is no reason to suppose that all life, whether extinct or extant, has to be on one tree. The fact that all extant cellular-based life is in fact on one tree is just the way it panned out. Alien life would not be on the tree either. 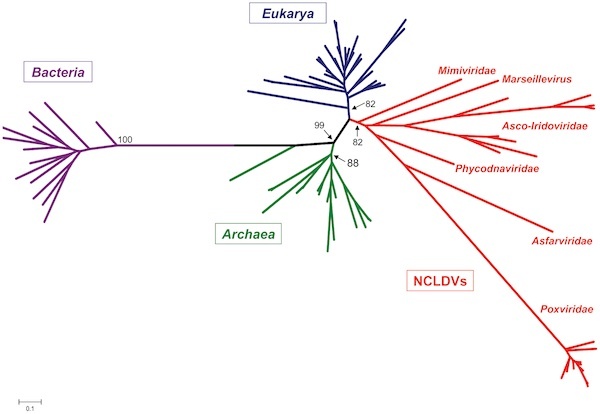 There has been an effort to put NCLDV viruses on the tree - plenty of proposed trees with viruses on them (so-called Fourth Domain hypotheses). Whether they are valid or not is not the point I wish to make here. It's highly doubtful that viruses comprise a single group of entities that are related by common descent anyway. They are too varied. It's not clear when viruses first appeared. They are thought to be ancient and to have been around for at least as long as cells have. Again, viruses are very diverse, and so they probably have appeared multiple times. Some have speculated that viruses (or virus-like entities) may even have been around before cells arrived on the scene. I would call it a self replicator molecule too. I don´t consider it a living being... Viruses don´t have metabolism, don´t have homeostasis nor Irritability (well unless we consider the interaction virus-host cell. By the way I don´t know if in english it is called irritability; I´m referring to the cells capacity to respond to different stimuli).